380hp @ 7000rpm, 4,962cc. 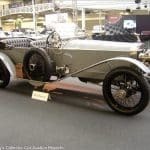 single overhead camshaft V12 engine, 5-speed manualtransaxle, independent front, de Dion rear suspension, 4-wheel drum brakes.Wheelbase 2,420mm. Ferraricreated the 410 Sport to dominate the 1955 Carrera Panamericana. It was theultimate high speed Ferrari hot rod; the biggest, baddest, meanest sports racerFerrari had ever built. Duringthe mid-Fifties, cars, engines and chassis of all sorts poured out of Maranelloin a steady stream of competitive enthusiasm. The factory and its clientsdreamed up combinations they thought would be competitive in a series, or evenin a specific race, andMaranello’s craftsmen obliged with a racing car to suit. The Ferrari 410 Sportwas one of those cars, conceived, constructed and developed specifically forScuderia Ferrari to respond to the extreme and unique conditions of the 1955Carrera Panamericana. 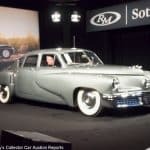 They were among the most powerful sports racing cars builtin the 1950s with 4.9 liter engines of nearly 400 horsepower and even moretorque, over 400 lb-ft. Just two cars were produced and during their heyday the410 Sport was virtually unbeatable. Ferrarihad been dealt a stinging defeat by Lancia in the 1953 Carrera Panamericana,nearly costing Ferrari the Manufacturers Championship. In 1954, despitecapturing the first two places with Umberto Maglioli’s 375 Plus and the PhilHill/Richie Ginther 340/375 MM Spider, the Porsche 550s of Hans Herrmann andJaroslav Juhan had nipped at the big Ferraris’ heels throughout the race,eventually finishing ahead of Franco Cornacchia (250 Monza) and LuigiChinetti/John Shakespeare (375 MM) who in turn barely beat Ak Miller’sOldsmobile-powered hot rod, “Caballo de Hierro” (Horse of Iron). Thebig 4.9 liter 375 Plus proved to be a handful for its drivers on the Carrera’slong but bumpy straightaways. The long wheelbase, narrow track, high center ofgravity and forward weight bias made the big cars unstable at high speeds. JackMcAfee, a highly competent driver with plenty of Carrera experience, drivingTony Parravano’s 375 Plus lost control on the first leg of the race andcrashed heavily resulting in the death of his co-driver Ford Robinson. The1955 Carrera Panamericana clearly required something new and radicallydifferent. That, Ferrari determined, would be the 410 Sport. Their purpose wasclear from Ferrari’s chassis and engine number suffixes: CM for “CarreraMexicana”. They were not, however, to fulfill their destiny in Mexico. Theracing world’s upheaval following seven deaths in the ’54 Carrera and thedevastating accident at Le Mans in ’55 meant there would not be a 1955 CarreraPanamericana, yet the two 410 Sports created for it became legends, the mostawesome of the Ferrari racing cars based on Aurelio Lampredi’s “longblock” V12. Ferraricreated a total of four cars in this series. The first two, 0592 CM and 0594 CM,were client cars called 410 Speciales and went to Tony Parravano in Californiaand Michel-Paul Cavallier in France respectively. 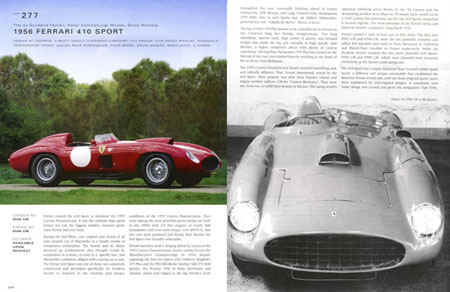 The two 410 Sports, 0596 CMand 0598 CM, were intended from inception as Scuderia Ferrari’s factory teamracing cars. The410 Sport was a major departure from Ferrari’s earlier sports racers, adifferent and unique automobile that established the direction Ferrari wouldtake until the front-engined sports racers were supplanted by mid-engineddesigns. A completely new frame design was created and given the designationTipo 519C. Its wheelbase of 2,420mm,the same as the later 250 Testa Rossa customer cars which are universallypraised for their handling, stability and responsiveness, was much shorter thanthe 2,600mm of the 375 Plus. All subsequent Ferrari sports racers would usesimilar wheelbase lengths. The frame itself was a brand new design,unprecedented in earlier practice and never used again. It was built aroundunusually high aspect ratio (much taller than wide) oval main tubes with twosets of smaller parallel tubes, one above and one outboard of the main tubes.Forming a triangle in cross section, these frame rails were joined by amultitude of smaller tubes creating what is, in effect, nearly a space-framechassis, a structure of exceptional strength and rigidity, designed and executedto cope with an immensely powerful engine and the rough roads and high speeds ofthe Carrera Panamericana highways. Theindependent front suspension used parallel A-arms with coil springs. At the rearFerrari adopted its reliable and well developed transverse leaf spring de Dionsuspension located by trailing arms and a sliding block in a track integral withthe differential. The suspension used Houdaille lever shocks all around. The375 Plus had demonstrated that although its power was capable of delivering 185mph on the Carrera’s long straights it had a steep torque curve that peaked athigh rpm. With only four speeds in its gearbox it was impossible to keep theengine at the peak of its power curve. The 410 would have to address and remedythat shortcoming which Ferrari accomplished by adding a fifth gear to thetransaxle. Drivers now had a choice of ratios for the Carrera’s widelydifferent conditions and closer spacing to deliver the engine’s power moreeffectively. Ferrarichose the new Tipo 126 cylinder block being developed for the Superamerica andSuperfast GT cars, a brand new short stroke design, as the basis for the engine.Designated Tipo 126C, the engines of the first two 410 Speciales used singleignition and three Weber W40 DCF/3 carburetors to give 345hp. The final two carsin the series, the Scuderia Ferrari 410 Sports, benefited from the factory’sFormula One experience with spark plugs located both inside the engine’s veeand outside next to the exhaust headers. With 24 plugs fired by fourdistributors or magnetos combustion chamber flame spread was uniform,particularly with fuels of questionable octane rating which they might be forcedto use in Mexico. The big bore Tipo 126C took advantage of its large 88mm bore(13.5 mm more than the 375 Plus) to accept huge valves which were fed fromcavernous intake ports and three unique Weber 46 DCF two-barrel carburetors withmagnesium alloy bodies. Ferrari’s engine designers carefully crafted acompromise between maximum power and a healthy and broad band of usable torque.Needless to say, with 380hp at 7000 rpm and a whopping 403 lb-ft of torque at5000 rpm, the engineers successfully met their objective. Torein in this impressive urge Ferrari developed gigantic drum brakes that werecleverly mounted clear of the tires, a placement that both reduced unsprungweight and exposed the aggressively vented brakes’ deeply finned aluminumdrums to cooling air flow. The front drums project fully 2½” into theairstream while the rears are completely exposed, separated by an inch from thewheel’s inner edge and lavishly ducted for lots of fresh, cool air. The 410Sports are the only Ferraris known to employ such radical efforts to keep theirbrakes cool. Ferrari provided huge fuel tanks with 195 liter (51.5 gallon)capacity, enough to complete even the longest high speed legs of the CarreraPanamericana without running dry. The24-plug Ferrari 410 Sports were bodied by Scaglietti, now firmly establishingitself as Ferrari’s competition coachbuilder. No longer barchettas in conceptor execution, the 410 Sport Spiders’ bodywork shows the direction Ferrarisports racers would take for the coming years, establishing the style that wouldclothe the 290 MM, 860 Monza and Testa Rossa. Low and wide, Scaglietti’s 410Sport Spider coachwork visually squats over its larger tires. Dominated by abroad oval radiator air intake flanked by covered headlights at the point oftapered elongated teardrop fenders, a vast engine cover extends over the top ofthe fenders to give reasonable access to the outside row of spark plugs.Intended to be driven single-handed, an aluminum panel covers the passenger’sseat area which also contains the dry sump oil tank. The 410 Sports were thefirst Ferrari sports racers created in this style, at once flowing and brutal,with a purity and originality that oftentimes characterizes the first executionof a new concept. TheScuderia Ferrari 24-plug 410 Sports were prepared as factory entries in the1000km of Buenos Aires on January 29, 1956, the opening event of the 1956 SportsCar Championship schedule. Held on a composite circuit made up of long straightslinked by a “parabolica” at one end and city streets at the other it wasknown as the Autódromo Municipal y Avenida General Pax. The race was 106 lapsof the 9.476 km course for a total of 1004.5km and was described by some assimilar to the daunting Avus circuit in Berlin. Driven by Peter Collins/LuigiMusso (0596 CM) and Juan Manuel Fangio/Eugenio Castelotti (0598 CM) the 410Sports were split on the Buenos Aires front row by the Phil Hill/OlivierGendebien Ferrari 857S. Scuderia Ferrari’s two 4.9 liter behemoths thunderedoff with Peter Collins eventually setting the fastest race lap of 102.5mph in0596 CM before both the 410 Sports retired with transaxle failures. It was the410 Sports’ first and last factory race; 0596 CM was sold to Swedish driverSture Nottorp and 0598 went to US West Coast stalwart John Edgar. Edgarput his 410 Sport in the quick hands of Carroll Shelby and the pairing went onto dominate the 1956 SCCA races it entered, winning virtually everywhere itappeared. 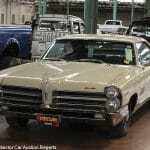 With conscientious maintenance by Joe Landaker, who had joinedEdgar’s equipe along with Shelby from Tony Parravano’s squad,the 410 Sport was unbeatable except by misfortune. Misfortune’s ugly head, itseemed, was rarely raised. 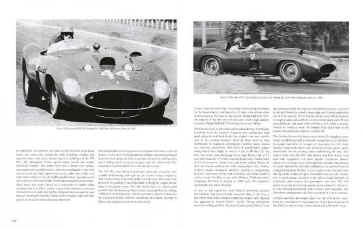 In1957 John Edgar, miffed at perceived slights from Ferrari, bought the latestMaseratis as his front-line race cars and the 410 Sport took a back seat tothem. This created an opportunity for up-and-coming drivers when Edgar’s teamhad time to prepare the 410 Sport. 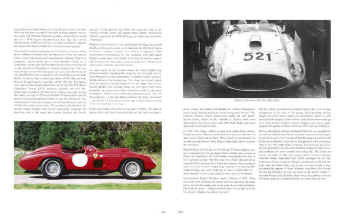 The410 Sport’s potential was realized against the most intense competition of itstime in US events where free-spending owners bought the finest sports racers thefree-spirited talents in Italy could provide and put in their drivers’ seatsheroes who would go on to win racing’s brightest honors. Edgar’s team neveragain enjoyed the success it had in 1956 and 1957 with the 410 Sport. Thecar offered here, Ferrari 410 Sport 0596 CM, was modified by the factory withfour distributors mounted at the back of the engine instead of its earlierfront-mounted Marelli magnetos and was sold by Ferrari to Swedish driver StureNottorp with a Ferrari factory entry in the 1956 Mille Miglia. Nottorp’s 410Sport was present in Brescia, pictured at the time with headrest fairings forboth driver and co-driver, but never crossed the starting line. The details arelost in the mists of time and racing politics,howeverNottorp thereafter firmly maintained that Ferrari sabotaged the car. Theimportance of race purses to Ferrari’s commercial survival in the Fifties (andthe Mille Miglia was a very rich race) lends at least circumstantial support toSture Nottorp’s contentionthat Ferrari saw the big 410 Sport as a seriousthreat to the factory entries, 3½ liter 860 Monzas and 290 MMs whichwould be gobbled up by the 410 Sport, andsaw to it thatNottorp’s410 Sport did not start. Nottorp’sdisappointment was understandable but he entered the 410 Sport in the 1956Swedish Sports Car Grand Prix on August 12 with co-driver Olle Andersson. Swedenwas the final race of the five events in the 1956 Sports Car Championship whichhad begun so eventfully for the 410 Sport at Buenos Aires seven months before.The race was a stressful 153 laps of the 4.06 mile Rabelöv circuit, and ofcrucial importance as once again Ferrari and Maserati were tied for theManufacturers Championship. Ferrari emerged victorious but only 14 cars finishedof 27 starters. One of them was Nottorp and Andersson in seventh. 0596 CMcontested other events in Scandanavia for the next year and in November 1957Nottorp advertised 0596 CM for sale in Road& Track. Itwas eventually acquired by Bill Danielson in the U.S. who entered it in several1959 USAC road races in California driven by, among others, Tony Bettenhausenand Skip Hudson. After only a year’s racing Danielson advertised the 410 Sportagain in late 1959 and then retired it where it remained in a state of suspendedanimation, exactly as it had raced, until it was acquired thirteen years laterin 1972 by Pierre Bardinon’s renowned Mas du Clos museum. It remained there,still unrestored, for a further thirteen years. Subsequently part of threeimportant Ferrari collections, 0596 CM is now offered by only its seventhindividual owner from new in race ready condition, a pristine, complete andentirely original example of one of the most powerful front-engined ScuderiaFerrari sports racersever built. 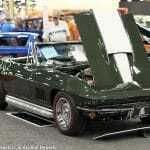 Everypart of this truly awesome machine exudes muscle, perhaps more than any Ferraribefore or since. The earlier 375 MM is lithe by comparison. The relativelyubiquitous 250 Testa Rossas are dainty when confronted with the authoritative410 Sport. Scaglietti’s flowing lines are skillfully juxtaposed with anassortment of air intakes to feed the massive engine and brakes; access panelsfor the radiator and oil tank highlight that this is a purpose built race car.Immense brakes fill the Borrani wire wheels. Construction details like theintricate and finely detailed transaxle and brake castings show the artistrylavished upon it by Ferrari’s craftsmen. The giant hood, spilling over intothe front fenders, leaves no doubt that the 24-plug 4.9 liter motor is itsheart. Perhaps no other automobile is so brutish yet beautiful at the same time. The410 Sport’s sound is quite simply spectacular, a unique thundering rip. OtherFerraris’ voices may be described as ripping velvet but the 410 Sport’s V12declares its potency with the vital sound of rending canvas that can be heardfor miles. Ona recent test at Willow Springs, the 410 Sport delighted its drivers with itspredictable and stable handling and brutal acceleration, pulling strongly from2500 rpm and exploding above 4000 rpm. Strong brakes tame the awesome power andtorque. Looking over the protruding hood and carburetor hood scoop the pavementdisappears beneath the 410 Sport at a prodigious rate, instantly creating in thedriver’s mind the realization that the great factory drivers Collins and Mussosat here and had the same spectacular visual, physical and aural experience. 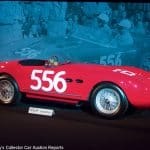 The410 Sport was simply the biggest,baddest hammer Ferrari had ever constructed, a monumental automobile thatpresaged such front-enginedtwisters as the Scarabs which would dominate unlimited sports car competitionuntil the dawn of the mid-engined Can-Am age. The 410 Sport prevailed in themost competitive races in the world in 1956 and 1957, the US West Coast SCCAevents, and introduced drivers who would become World Champions in sports carsand Formula One to the essence of power, handling, balance and performance. Evendecades after driving it each of the racing legends who experienced the 410Sport remember it vividly, a measure of the impression which its power andhandling made upon them. To a man they describe the 410 Sport as a benign,predictable and tractable race car. In Carroll Shelby’s words, “It was TheBrute of the brutes,” but if, as Shelby noted, the 410 Sport was “… a carthat didn’t have any bad vices,” its good vices must have been its power andtraction. 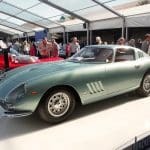 Ferrari410 Sport 0596 CM will bring its new owner the thrill of a landmark Scagliettibody, 380hp and 400+ lb-ft of Ferrari V12 and a rock solid chassis designed forthe rigors of the Carrera Panamericana. It will be an extremely competitivevintage race car, one which has rarely been seen and that will become even morecompetitive with further development. Its reliability has been proven time andagain, along with its potency. 0596 CM additionally benefits from a light racingcareer apparently free of accidents and it has had a succession of careful,meticulous and sympathetic owners who have nurtured its originality until todayit has a mellow patina that is a delight to behold. Infact, 410 Sport 0596 CM is as it was in the 1950s – glimmering red paint onthe gently patinated original panels. The marks of Scaglietti’s craftsmen havenot been erased by restoration, instead 0596 CM looks as it did in the periodphotos, the product of artisans. It is rare that such an important sports racingcar is so beautifully preserved. It is also completely original in itsconfiguration, as confirmed by its Ferrari factory build sheets, even includingthe 46 DCF Weber carburetors that are unique to the 410 Sport. It still has thebelly pans that enhanced its high speed aerodynamics and visible under the reardeck is the row of rivet holes where the passenger’s headrest fairing wasattached for the 1956 Mille Miglia. The intricate construction and qualityworkmanship of its builders is still apparent, particularly in the complex frameconstruction which is visible beside the engine, under the cowl and inside thepassenger’s compartment. It is,in fact, as original as a front line Ferrari race car ever gets and far moreoriginal than Ferrari sports racers costing much more. 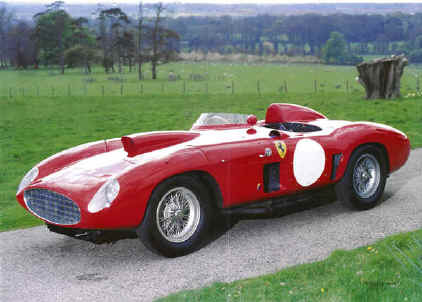 Importantly,Ferrari 410 Sport 0596 CM has never been to the major Ferrari events, vintageraces and concours d’elegance. 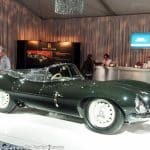 Its new owner will have the opportunity topresent this important and beautiful Ferrari for the first time to the mostprominent and felicitous events, including the upcoming Ferrari Anniversary atthe Pebble Beach Concours d’Elegance in 2004. Ferrari410 Sport 0596 CM is a landmark automobile that puts other Ferraris and theircompetitors from Maserati, Jaguar, Aston Martin and Porsche in the shade. Itwill be a welcome entry in concours, Ferrari events and an outstandingcompetitor in the Shell Ferrari/Maserati Historic Challenge, Mille Miglia Retro,California Mille or Monterey Historics. Even among the exceptional fields ofthese or similar events,Ferrari 410 Sport Spider 0596 CM will be a standout participant. Clickhere to return to the CatalogDescriptions Index Page.